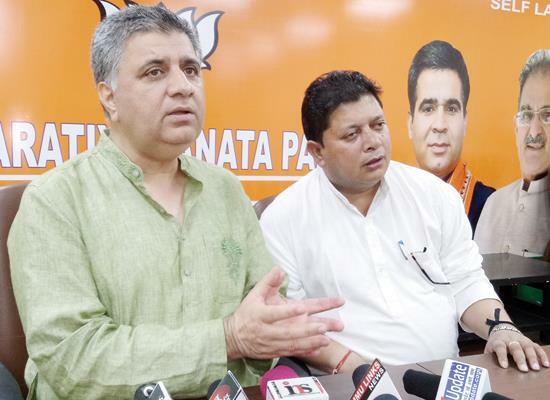 Jammu, Aug 12: The state unit of BJP on Saturday sought an unconditional apology letter from former Chief Minister of Jammu and Kashmir state Mehbooba Mufti, for allegedly defaming an elected representative of public. The former Chief Minister on Saturday, while referring to the reports of two of BJP MLAs from Jammu region coming out in support of Article 35-A, which is facing a legal challenge in the Supreme Court, took the name of MLA Rajesh Gupta. However, the BJP MLA from Jammu East Assembly Constituency here told reporters and clarified that he is a Nationalistic person and will never utter a single word against the interests of the state or the Nation. He said that he has never ever even thought of going against the party line and asked that how he can question the very basic ideology of party and never supported the Article 35-A. Mr Gupta elucidated that 35-A has only dented the image of Jammu and Kashmir since long and has destroyed the fortunes of the state. Due to 35-A, he said that Gorkhas, Valmikis, and women are devoid of their basic rights. ''West Pakistan refugees are considered outsiders. Industrialists hesitate to came to state,'' he said, adding that few days back, another Rajesh Gupta gave a statement on 35-A and mistakenly, one channel gave the name of MLA Rajesh Gupta, however, the channel soon apologised for the matter. The matter, after being clarified, again been taken up by a senior leader like the former Chief Minister, smells of foul play. Mr Gupta said that BJP will also take the matter into the notice of Speaker of J&K Assembly for the reason that one MLA has deliberately tried to tarnish the image of another MLA. He alleged that this is the result of dirty politics played by the former CM, which will be taken very seriously by the party. Earlier, BJP Chief Spokesperson Sunil Sethi levelled serious charges on Ms Mufti for downplaying with the esteem of an elected representative of public. He said the false and defamatory comments of former CM are unwanted and out of league and she must apologise for the same, unconditionally. Mr Sethi said that the former CM must acknowledge her mistake in writing, otherwise BJP can proceed to file a defamatory suit against her. He also said that party's disciplinary committee has already taken notice of the issue of MLA Dr Gagan Bhagat and referred to the Party President for further action.